Back to basic, go natural, are the words we mostly hear of this time. This mostly refers on consumers food preference s in the market. Consumer’s preference on vegetables are those naturally or organically grown. Increased consumer awareness of safety issues and environmental concerns has contributed to the growth in organic farming over the last few years. For decades, our agriculture production system relies on chemical agricultural inputs which is costly and bears negative effect on the environment and to human health. Good agriculture practice is the call of time to meet consumer needs and preference for products that are of high quality, safe and produced in an environmentally and socially responsible way. With this in mind, the provincial government of Surigao del Norte thru the Provincial Agriculture Office and together with the Department of Agriculture promote organic farming. This approach focuses on biological processes such as composting and other measures that maintain soil fertility, natural pest control, crop diversification, crop rotation and other soil and crop enhancing farm activities. Enhancing soil health is the cornerstone of organic farming. Healthy soils feed healthy plants and healthy plants feed healthy animals including humans who eat both plants and animals. To continue the promotion of organic farming, a two-day Training on Organic-based Vegetable Production was conducted in Brgy. Budlingin, Alegria and Brgy. San Jose, Mainit on May 2008, it aims to increase production of nutritious and safe to eat vegetables on these areas. 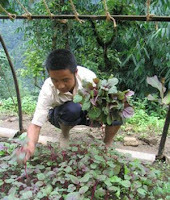 Vegetable production is their main livelihood and is into commercial growing. Said training was much awaited by the farmers as it help improve their farm practices and lessen production cost. They are enthusiastic about organic farming and vows to adapt the technology in their farms. In the recent 2007 Regional Winners in the Annual GAWAD SAKA Search by the Department of Agriculture, our farmer Jerry Moreno from Bacuag comes out as one of Outstanding Farmers in the region. His organic rice production practices were among the many credits that earns him the said prestigious award in the field of Agriculture.